A year-end vacation is a great way to pamper yourself and soak in different cultures, but let’s face it: between the long queues, insane layovers, and cramped seating, not everything about travelling is a breeze. Don’t let these travel negatives put a damper on your mood and a strain on your back. 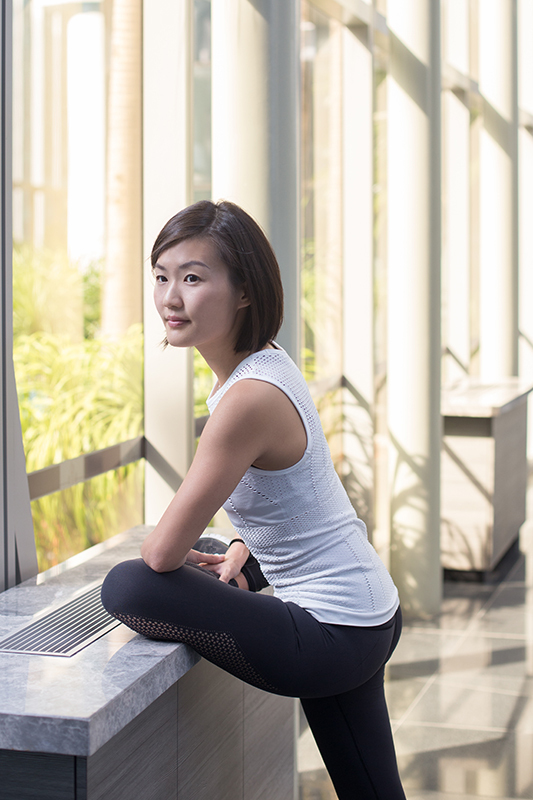 Start your holiday on a high note with these seven poses from Beh Hwee Sze, founder of Upside Motion. They can prepare your body for the flight, and also relieve bodily tensions after you land. The great thing is, they are easy to do in public, and don’t require any equipment, leaving you feeling refreshed without the bother of being in a gym. Benefits: The side stretch lengthens the muscles between your ribs and pelvis, and improves rib cage mobility and expansiveness of the lungs, allowing you to breathe easier. Step-by-step: Place one leg on any piece of furniture or chair (just don’t kick your neighbour). Keeping your leg straight, reach over your leg with your opposite arm. Be sure to hold your turnout and keep your hips square. Hold for a few seconds and breathe through the stretch. Repeat on the other side. Benefits: This pose has a multitude of benefits, from relieving pain and discomfort in the hip area to increasing circulation, which allows for the body to detoxify more efficiently. It also strengthens the hips, knees and ankle joints, and thigh muscles, increasing mobility and range of motion. Step-by-step: Stand in front of a counter top and lift one knee up. Flex your foot and stay here for 30 seconds. Fold your torso over for another 30 seconds. Benefits: Tricep Dips are a great way to strengthen your upper body and increase endurance. Incorporating this exercise into your routine will be sure to make lugging around your carry-on baggage a breeze. Step-by-step: With your back facing a counter top, position your hands behind your shoulders. Standing on one leg, bend elbows, dip down and repeat 10 reps. Switch legs. Benefits: Besides shaping, toning, and firming up your tush and legs, lunges are great for working your glutes and quadriceps, and engaging your hamstrings. Strengthening these large muscle groups can also speed up your metabolism, which is beneficial if you’re trying to shed weight. Step-by-step: Lunge forward on one knee, extending the other leg straight back, keep pelvis square. Hands can be placed on your hips or on a counter top in front of you for support. Sink lower for a deeper hip flexor stretch. Benefits: Leg pulses target the often-neglected hip flexor, sartorius, and abductor muscles. Besides toning and defining your lower body and core, these pulses prevent injuries and may help ward off lower back and hip problems, which may come in handy after sitting in your confined airplane seat for several hours. Step-by-step: Using a counter top as support, stand tall and balance on one leg. Lift the other leg straight front of you, pulse for 20 times. Switch to the side, pulse for 20 times. Kick leg back, pulse for 20 times. Switch legs. Benefits: The secret behind ballerinas’ sculpted calves, this classic barre move strengthens the calves, upper thighs, and ankles. It also challenges and improves balance, and fosters physical stability and symmetry. Step-by-step: Tuck in your core and align your spine. Hold onto another surface for support. Bend low to engage your inner thighs, and straighten your legs fully (and engage your glutes) between each rep.
Benefits: One of the most effective and efficient exercises you can do anywhere, planks engage all major core muscle groups to strengthen your core, give you better posture, reduce back pain, and help with movement and coordination. Step-by-step: Bend your elbows 90 degrees and rest your weight on the forearms. Make sure that your elbows are directly beneath your shoulders. Your body should form a straight line from your head to your feet. Hold the position for as long as you can. This helps develop strength in the core, shoulders, arms, and glutes.